Welcome to Blowing Rock, North Carolina, a peaceful mountain village nestled 4000 feet above sea level in the Blue Ridge Mountains. Known as the “Crown of Blue Ridge” Blowing Rock is home to 1,500 year-round residents, spanning two counties - Watauga and Caldwell. Blowing Rock residents enjoy an abundance of outdoor activities, including whitewater rafting, tubing, hiking, kayaking, fishing and skiing at the nearby Beech and Sugar Mountain resorts. From distinguished log cabins to mountain estates, the Blowing Rock area is known for its master-planned communities and world-class homes. Start your home search by using our advanced search tools. 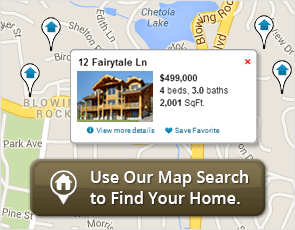 Search by interactive map, community, amenities, MLS number and more. And be sure to explore Boone, Banner Elk and other surrounding areas. To learn more about the Blowing Rock area, click here. And of course, if you would like to learn more about a property or schedule a showing, please contact us. Search the most recent listings below or click search to view all Blowing Rock real estate. Beautiful designer decor, immaculate condition. Search for real estate and learn more about the "High Country" by clicking on the towns listed below.